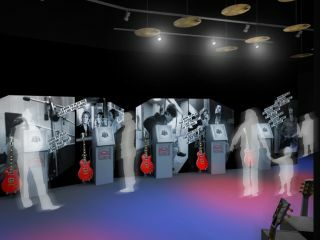 Gibson Guitar has announced its partnership with the British Music Experience, an interactive exhibition set to open at London's O2 Arena in March 2009. Within the BME will be The Gibson Interactive Studio, a studio space where every visitor will be able to pick up and play Gibson and Epiphone electric and acoustic instruments. Thanks to step-by-step video tuition, visitors will be able to learn to play the guitar and bass parts to hits by British artists such as KT Tunstall, Amy Macdonald and The Magic Numbers. There will also be a Slingerland drum kit to complete the full band experience. The BME will take over 22,000 square feet on the second floor of the O2. Alongside cutting edge audio-visual technology there will also be a collection of some of the most coveted music memorabilia on the planet. The BME will also enable visitors to trace musical trends through the decades, learn about music's influence on art, fashion and politics, allow visitors to download music from the BME archive and record their own songs. There will also be a full educational programme with workshops, lectures, master-classes and concerts. For more on the British Music Experience, visit the official website.